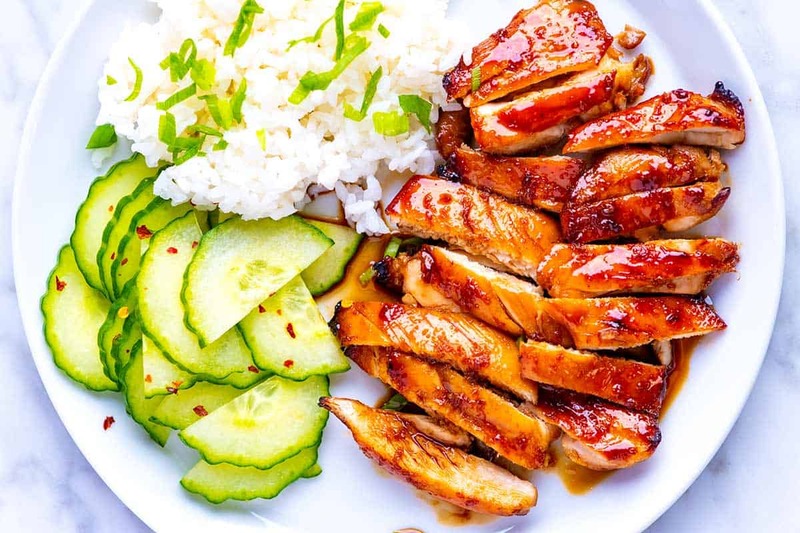 You’ll love this easy teriyaki chicken recipe that rivals your favorite teriyaki restaurants. Thanks to a simple teriyaki sauce that doubles as a marinade, the chicken is a little sticky, takes on a beautiful shine, tastes fantastic, comes together quickly, and can easily be made in advance. 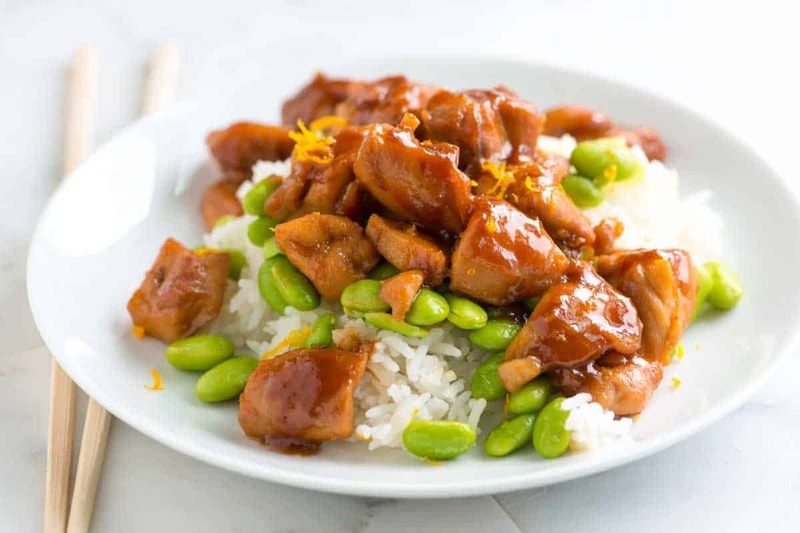 Jump to the Easy Teriyaki Chicken Recipe or read on to see our tips. If you are short on time, a quick 30-minute marinade will do (although we do prefer the chicken when it marinates longer). Since we use some of the sauce to baste the chicken while it cooks, you will still enjoy excellent results. For the best results, combine the chicken and marinade the night before you plan to cook it. 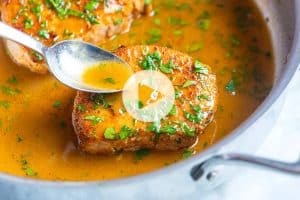 This way, the chicken sits in the sauce for a long time, and when it’s time to cook, all you need is 15 minutes, and dinner will be on the table! 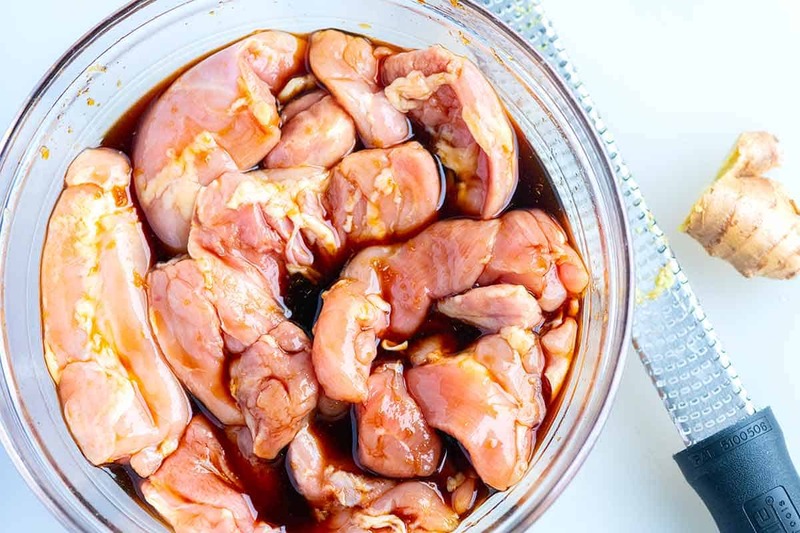 Freeze the chicken and marinade together then, the night before you plan to make teriyaki chicken, take the frozen chicken and marinade out of the freezer and thaw in the fridge. As it thaws, the chicken marinates in the sauce. Just like many of the chicken recipes on Inspired Taste, we prefer skinless, boneless chicken thighs when making chicken teriyaki. Thighs are more tender, cook quickly, and have more flavor than chicken breast. That said, there’s no reason why you couldn’t swap chicken breast for thighs. It’s entirely up to you. What’s the best way to cook teriyaki chicken? Traditionally, teriyaki chicken cooks over a grill. You could do that with this recipe, but we wanted to figure out a way to get all the benefits of a grill inside. The answer is to broil the chicken. Position an oven rack towards the top of the oven — about six inches from the burner is perfect. Transfer marinated chicken to a baking sheet and place the chicken onto the oven rack. Broil until the chicken is brown and starting to firm up. Flip the chicken and continue to broil until the chicken is cooked through. 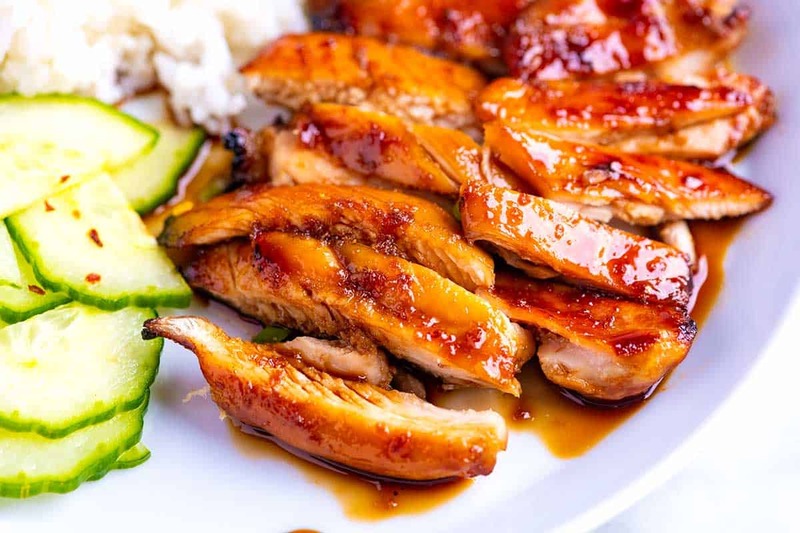 The cooking process takes about 15 minutes, and if you spoon or brush a little sauce over the chicken while it cooks, the sauce turns into a glaze and becomes shiny — just like at the best teriyaki restaurants. If you don’t have a broiler, an outdoor grill or a grill pan set onto the stovetop are excellent alternatives. You can also bake the chicken, although, you won’t get the same glazed look. That’s okay, though. It will still taste incredible! 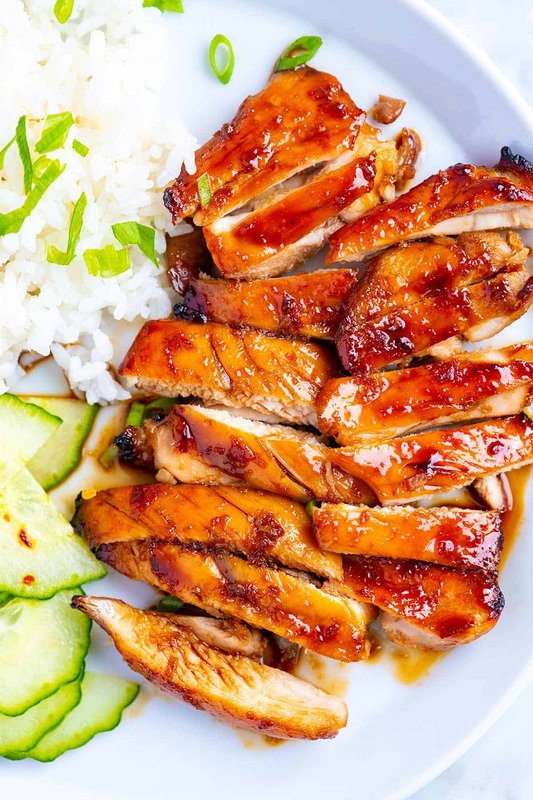 You’ll love this easy teriyaki chicken recipe that rivals your favorite teriyaki restaurants. 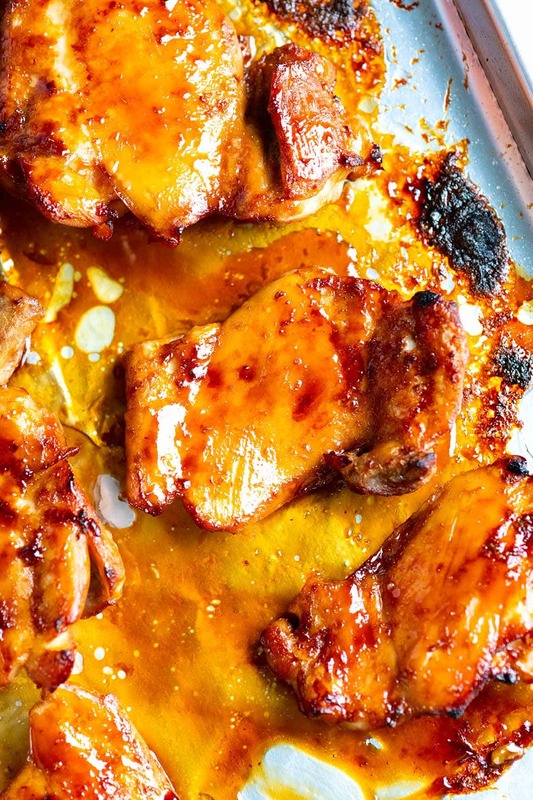 The chicken is best when marinated for a while (we like to marinate overnight), but you can get away with a shorter marinating period if you’re short on time. In our recipe, we’ve shared the ingredient amounts to make one batch of teriyaki sauce, which is perfect for 1 1/2 pounds of chicken. We highly recommend making a larger batch of sauce (it’s that good). You can find the instructions for a larger batch in our teriyaki sauce recipe (click here for the recipe). 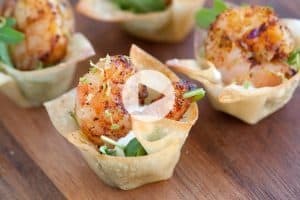 The recipe makes 2 cups, which provides enough sauce for two batches of chicken. The sauce stores for weeks in the fridge. If you make the larger quantity, you will need to use about 1 cup of the sauce for 1 1/2 pounds of chicken. Combine the soy sauce, sugar, sake, vinegar, and ginger in a small bowl. Stir until the sugar completely dissolves. Transfer about 6 tablespoons of the sauce to a resealable plastic bag or container and add the chicken. Marinate the chicken in the refrigerator, turning once, for at least 30 minutes, preferably longer. Add the remaining sauce to a small saucepan over medium heat. Bring it to a simmer and cook until the sauce reduces slightly and looks shiny; 3 to 5 minutes. If it reduces too much, add a bit of water to bring it back to a pourable consistency. Cool, and then save this in the refrigerator to use as a sauce for the cooked chicken. Position an oven rack towards the top of the oven, about 6-inches from the broiler. Heat the broiler to high. Line a baking sheet with foil, and then arrange the chicken so that the side that would have had skin is facing down. Spoon a bit of the marinade that was with the chicken on top and discard the rest. Broil for 5 minutes. Stay close to the oven to keep an eye on the chicken as it cooks. Flip the chicken, and then if there are any juices or sauce pooling on the pan, spoon or brush it back onto the chicken. Doing this a few times during cooking helps to add a shiny, browned crust to the chicken. Alternatively, you can steal some of the sauce saved for serving to spoon or brush over the chicken. Broil another 5 to 10 minutes or until the outside of the chicken looks brown and caramelized and the inside is cooked through. Depending on your oven, broil times may differ. Keep an eye on the chicken, if it looks or smells like it is burning, move the sheet pan down a rack. If the chicken seems to be cooking slower than expected, continue to broil until cooked through. Substitute for Sake: We love the delicate flavor of sake for teriyaki sauce, but if you cannot find it there are some alternatives. Mirin is a sweeter version of sake. You can either swap it for the sake and leave the sugar amount as is or pull back on the amount of sugar slightly to accommodate the extra sweetness. 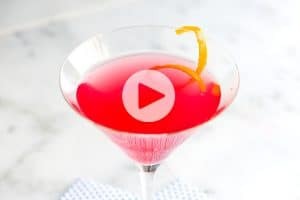 Dry vermouth or dry sherry can also work as a substitute. As a last resort, you can leave it out altogether, but keep in mind that this will change the taste of the sauce dramatically (taste the sauce before using as you may find that without sake/mirin, you will need to adjust with additional vinegar or sugar). Nutrition facts: The nutrition facts provided below are estimates. We have used the USDA database to calculate approximate values. You will likely have leftover sauce, so the actual nutritional data may be less. This looks fabulous! All your recipes that I have made are the best. Plus, you have a laid-back tone to your posts that I really appreciate. Can’t wait to make Teriyaki Chicken! Thank you and Merry Christmas!